The Prismic preview allows editors to preview updates without having to publish their changes. Preview works for changes on individual documents as well as for releases. The preview also allows editors to share those non-public changes with non-Prismic users. This is useful if you want to share early access to content or if you're looking for a stakeholder's validation. In this article we will show you how to configure and share a preview. From your repository's settings, you can set up one or more websites where content can be previewed. This allows you to preview on a production server, staging server, development server, etc. 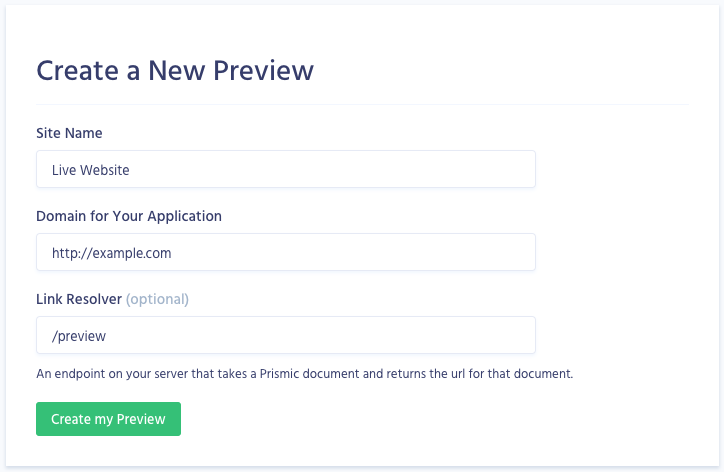 To set up a new preview for your repository, navigate to Settings / Previews. Here you can add a new preview site by entering the preview Site Name, Domain, and optional Link Resolver route. Once it's done, when an editor clicks on the preview button he will be redirected to the page domain that you entered in the settings. It's important to add the toolbar on every page. You need to make sure to add it on your 404 page if you want to be able to use the shareable preview. This is mandatory to share content that has not yet been published. From the document edit page or on a release page, click on the preview button (the eye icon in the top-right) and a new tab will open taking you to the preview session. Once you're on a preview session, you can click on the bottom left button Share link to this preview with your team and copy the shareable link. Once it's done you will be able to share it on slack, email, or any other platform in order to invite a non-Prismic user to preview the content on the web or mobile.